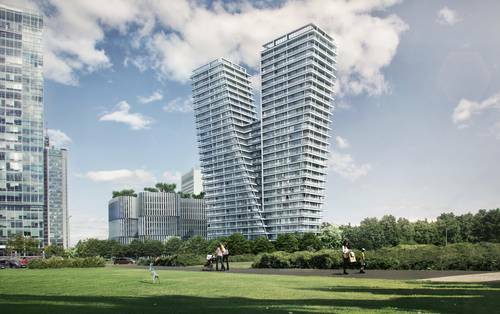 Opened at the end of 2017 the unique V Tower is a distinctive addition to the Prague cityscape. With a striking V-shape and 104 metres in height, this is the Czech Republic’s tallest residential building. 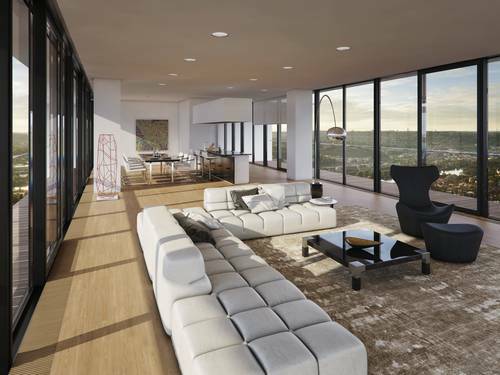 The V Tower’s thirty floors offer a premium living space. This is evident not only from the fantastic view of the Czech Republic’s capital but also in the meticulous technical and aesthetic fit-out of the flats. This exclusivity extends to the bathrooms: Where 115 exquisite bathtubs of superb quality, made of superior Kaldewei steel enamel have been installed. Levels one to four of the building, designed by architect Radan Hubička, is the commercial area featuring offices and retail units. From the fifth floor up, every conceivable desire for a dream home has been fulfilled, here, everything revolves around perfect comfort. The fit-out of these luxurious flats is timeless and elegant, fine natural materials such as oak, Italian marble, granite from Zimbabwe or green onyx from Iran have been used. The flats are fitted with an innovative heating system and sophisticated room acoustics. Residents access their homes via the lobby with a 24-hour concierge service, their leisure time can be spent on the Club Floor – a level designed specifically for relaxation and entertainment with a gym, pool and sauna as well as a private cinema and a children’s area. Additional services such as housekeeping, laundry, a florist, babysitting and dog-sitting complete the package. Bathing and relaxing in a distinctive setting. 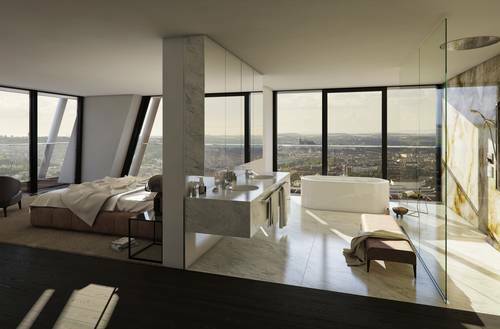 Residents in all of the flats enjoy imposing views of Prague’s historic city centre and the greenery of nearby parks thanks to room-height windows, which extend to the bathrooms as well. The V Tower’s creators selected Kaldewei for the bathrooms. A total of 115 bathtubs from the Ahlen-based premium manufacturer allow residents to bathe and relax in luxury. 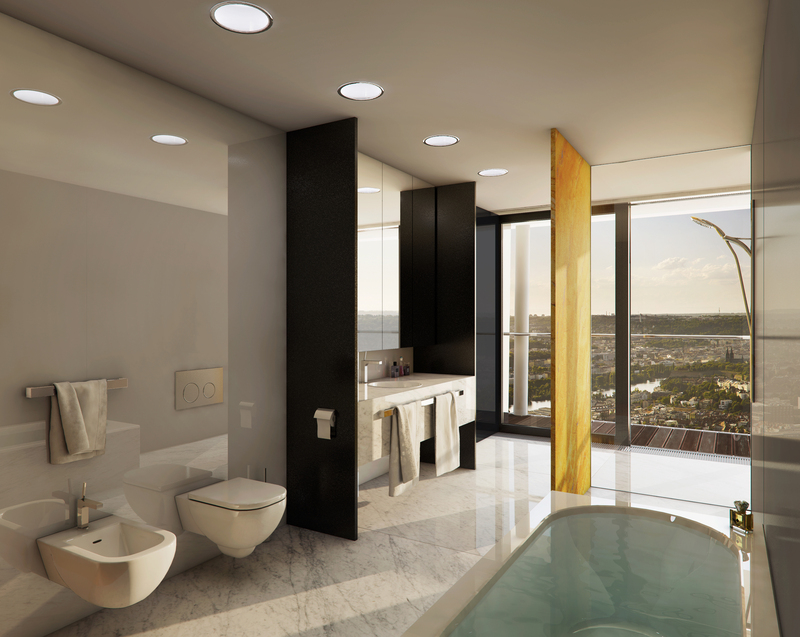 Eight Meisterstück Centro Duo Oval bathtubs were installed in the spacious penthouses. The lines of this freestanding bathtub with enamelled panelling are both sensual and striking, this model – placed directly in front of the floor-to-ceiling windows –perfectly suits the bathroom fit-out at the V Tower. The classically elegant Kaldewei Classic Duo bathtub was chosen for the remaining bathrooms. All bathtubs are “Made in Germany” from superior Kaldewei steel enamel: this special material fuses steel and glass, the characteristics of these two natural materials producing the perfect symbiosis. Resilience and longevity combine with exquisite style. 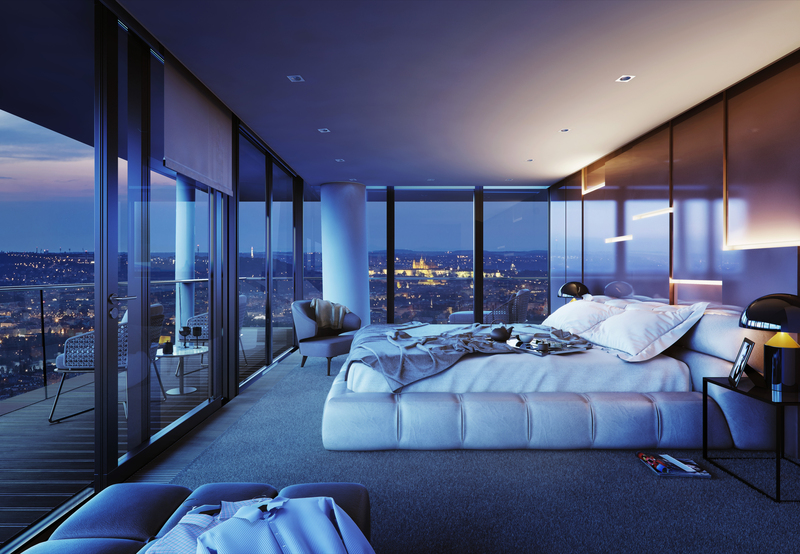 The V Tower in Prague offers exclusive living and lifestyle space across 30 floors: this imposing building was opened at the end of 2017. 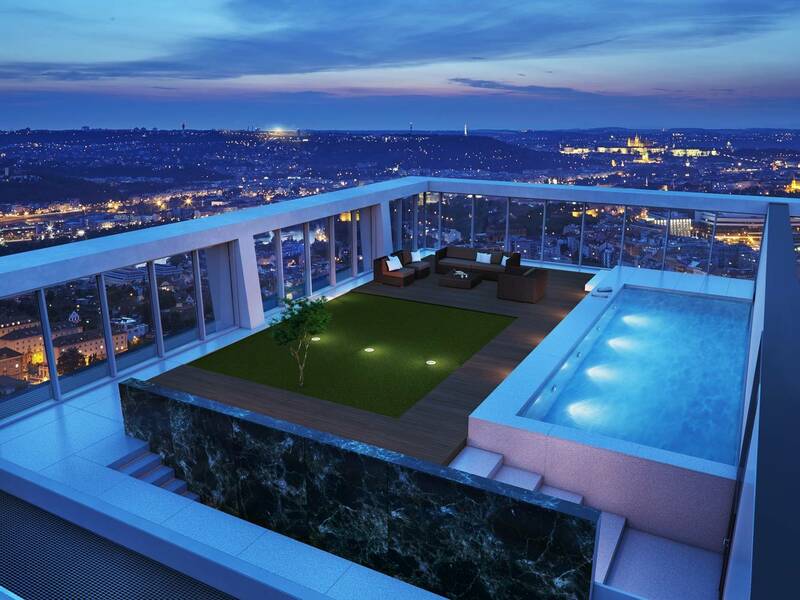 Pool with view in a penthouse: The V Tower’s residents also have access to an in-house gym with spa area, inclusive of pool and sauna. Meisterstück Centro Duo Oval bathtubs invite residents of the V Tower’s penthouses to enjoy relaxed bathing. This special Kaldewei model stands for sublime elegance, fitting perfectly into the luxurious interior. More than 100 bathrooms in this striking building were fitted with Kaldewei Classic Duo bathtubs – inclusive of a panoramic view. Unmissable exclusivity: Every detail of the V Tower has been meticulously thought out – from the technical fittings to the aesthetic interior design. The view from the V Tower is just as impressive at night. Room-height windows offer an unobstructed view of the local parks and Prague’s historic old town.